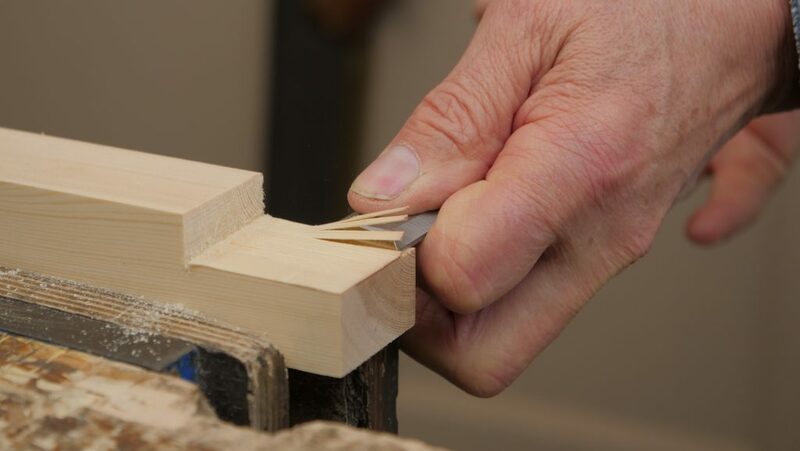 When chopping paring or splitting, you should ensure the chisel is presented to the wood at the appropriate angle. 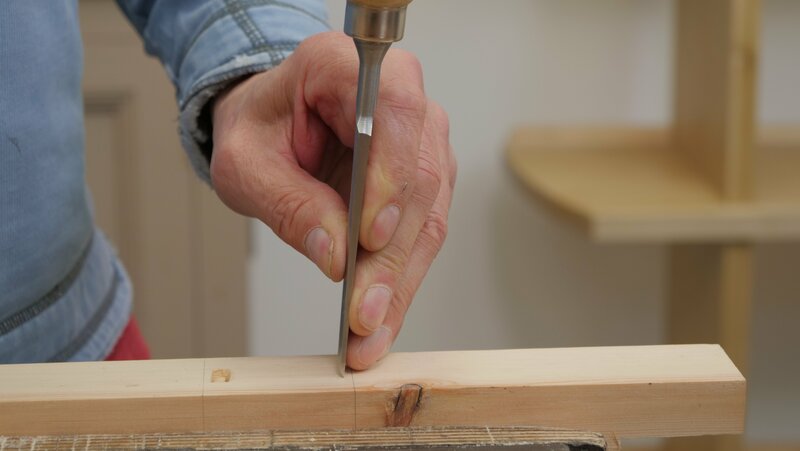 When you are paring wood you should rely on hand pressure only and use both hands to present the chisel to the wood. 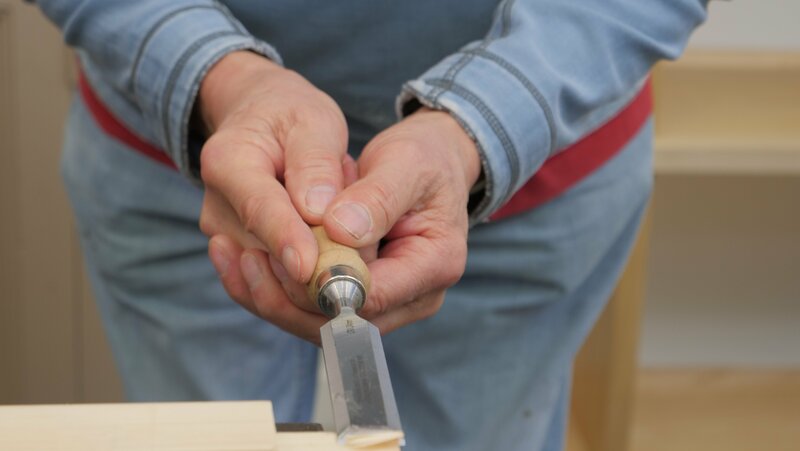 With your dominant hand on the handle and the other wrapped around or pressing the blade, push the chisel with a slicing motion into the wood. Sometimes you might find it useful to use the heel of your dominant hand to apply small blows when the full force of a hammer isn’t needed. 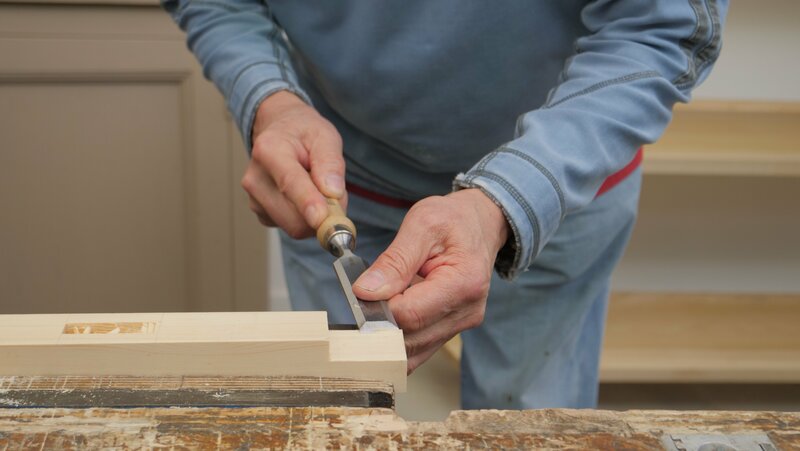 Another use of a chisel is to split cut. To do this, you position the cutting edge of the chisel on the end grain of the wood and strike the chisel with a chisel hammer. This drives the chisel into the fibres along or with the grain to split the wood away in chunks rather than shavings. This is a great method for when you are removing lots of material quickly, however you are limited by the direction of the grain, which is not always straight or to your advantage. 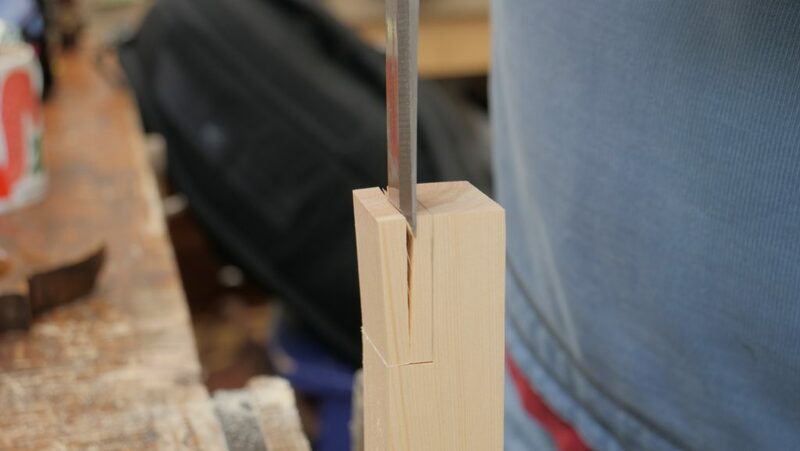 A stop cut is often needed to control how far the wood splits. To chop cut using a chisel, cut directly into the grain, usually perpendicular to the grain but not always. This technique is used for chopping mortises and various recesses. After striking with a hammer, if the chisel doesn’t dig into the wood, then reconsider the angle you are presenting the chisel. This method works best when removing sections of material at a time. 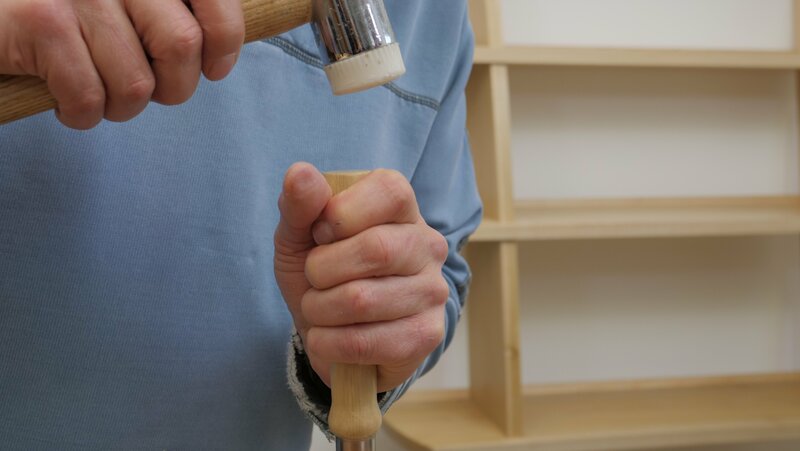 When using the chisel you can either grip the chisel handle or the metal part of the chisel (keeping your hands well away from the cutting edge). You can use a chisel hammer or a mallet to help drive the chisel. 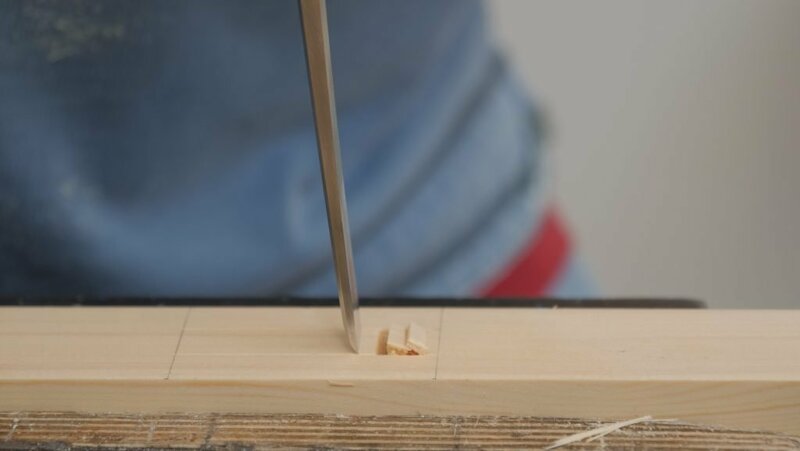 Using the fingers and thumb to support the blade of the chisel near to the cutting edge with the fingers tracing the surface of the wood gives more accuracy to start the chisel. 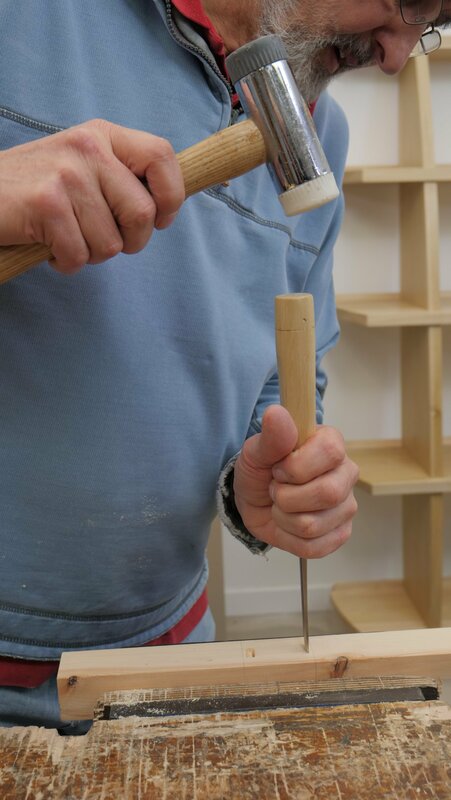 We often change hand positions, once the chisel has cut through the surface, to use the handle. This gives a secure grip with sufficient ability to shift the angle according to how the wood feels through the chisel. Holding between the handle and blade- holding both the chisel handle and the blade around the meeting point gives lighter control and greater sensitivity. Starting the chisel for paring cuts is more accurate when we use the non dominant hand to guide the chisel in the opening cuts. Once we have done this, we change hand positions to envelop the handle with both hands. Questions on Chisels- Japanese, Western?